Once again, The Orville takes a familiar Star Trek-trope, in this case the event of first contact between a sophisticated spacefaring race and a less-developed planet. Star Trek has long held to its ‘prime directive’ that forbids revealing the existence of spacefaring civilizations to such planets unless they have asked for help, or have developed interstellar travel themselves. The Orville has a slightly more lax standard for first contact; the Planetary Union will send an envoy to make contact if a planet simply sends a radio contact message out into the galaxy (by this criteria, an active signal from Project SETI might’ve qualified Earth for membership some time ago). The Orville’s “All the World is Birthday Cake” (lyrics from the Beatles’ tune, “It’s All Too Much”) aggressively deflates the long overdue quackery that is pseudoscience. On the Orville, Captain Ed Mercer (series writer/creator/producer/star Seth MacFarlane) and his first officer/ex-wife Commander Kelly Grayson finally welcome their permanent replacement Security Chief, Lt. Talla Keyali (Jessica Szohr); who, like the previous SC Lt. Katan, hails from the gravitationally-oppressive planet of Xeleya, giving her similar super-strength in Earth G.
Right off, Talla Keyali seems markedly different from the waifish Lt. Katan; she is much more assertive and seasoned. While the character is superficially similar both in species and overall look to her predecessor, her personality promises to be very different. I think she’s going to prove to be a smart choice. Ed and Kelly look for any chance to ruffle Bortus’ feathers. Meanwhile, on the bridge, Kelly is goaded by the captain to approach Third Officer Bortus (Peter Macon) about the idea of celebrating their forthcoming six day apart birthdays in one celebration. The deadpan Bortus immediately rejects the idea, saying that he wants his own party separate from Kelly’s. Bortus will NOT share a birthday. Less cake…fewer presents. The ship then receives the first contact signal from Regor 2 and the crew is ecstatic; this is why they’re out in space to begin with…first contact with a new species. To seek out new life, and new civilizations… okay, different space show, but you get the idea. Ed meets with the imperfect Prefect. The signal makes for a joyous occasion as the crew immediately sets a course for Regor, and in a scene that plays like a celebratory version of “The Day the Earth Stood Still”, an Orville shuttle lands on the lawn of the capitol building. Ed, Kelly, Bortus, ship’s physician Dr. Claire Finn (Penny Johnson Jerald) and Talla are all welcomed by the Prefect and his delegation. The Planetary Union officers are met by a Regorian welcoming committee. The crew are then taken on a tour through the capitol city, where they are shown the radio control center, and the local hospital, where Dr. Finn and Talla are given a tour of the obstetrics’ ward. Finn is concerned by the unusual number of risky, premature C-section births that seem to be occurring. The tour’s doctor tells her the babies are being removed prematurely to avoid being “Giliacs.” The term has no translation nor immediate meaning to Finn or Talla, but Finn makes note of it for the time being. The once-kindly Regorians are officially pissed. Later, during a reception dinner, the mood is (at first) jovial and festive, as Talla demonstrates her superior strength by effortlessly bending a candelabra, much to the delight of her hosts. All seems well, until Kelly casually mentions that this occasion makes for a nice birthday present for she and Bortus. The Prefect and his entourage are mortified; they seem shockingly offended that Bortus and Kelly have birthdays at this time. The Orville landing party is immediately taken into custody for brining “Giliacs” to their reception. Under the rules of first contact, Ed and his officers offer no initial resistance, as it may simply be a cultural misunderstanding. Bortus in prison…for the crime of being born under a bad star. While in custody, the rest of the crew (save for the isolated Bortus and Kelly) have samples removed from their teeth (ouch) to determine if they too, are dreaded Giliacs. They’re found not to be and eventually released, but Kelly & Bortus are taken away to a Giliac concentration camp, where they are kept with the rest of Regor 2’s undesirables Giliacs. Ed is determined to negotiate for the release of Bortus and Kelly. Back on the ship, Admiral Perry (“Cheers” star Ted Danson) instructs Ed not to go in, guns-blazing, in a rescue operation, or the Planetary Union will be seen as no better than the savage fundamentalist Krill species. After nearly a month spent in unsuccessful negotiations for the release of his people, Ed is ordered to take the Orville out of orbit in 24 hours, and continue on her mission. The Union diplomatic corps will continue efforts to release Kelly and Bortus. Claire and Ed try to figure it all out. Ed caucuses with his people. Dr. Finn offers a theory as to what a “Giliac” might be; the people of Regor 2 are adamant believers in the pseudoscience of astrology. The Regorians believe that people born under the constellation of ‘Giliac’ (around the time of Kelly & Bortus’ birthdays) are cursed due to a star that went dark in that constellation millennia ago, turning it into an omen of bad luck. Kelly goes off to comfort the devastated Ukania (on the floor). Back in the Regorian Giliac labor camp, Bortus and Kelly assist in the secret birth of a baby girl, whose existence is temporarily kept hidden for fears she’ll be taken away from its cursed mother Ukania (Jennifer Landon). During a tense camp inspection by the sadistic guards (shades of “Stalag 17”), the baby’s father tells the guards of his baby’s existence in the hopes she will be given a better life, since she is born under a more favorable constellation usually reserved for leadership. Ukania is devastated as her baby is taken away. Kelly decides it’s time to act like an undesirable. Gordon and John save the day by reaffirming a superstition. Genius Chief Engineer John LeMarr (J Lee) and helmsman Gordon Malloy come up with an idea of deploying a permanent orbital solar sail (via shuttlecraft) that might fool the Regorians into believing the cursed star in the Giliac constellation has somehow ‘reignited’ back into life, changing the constellation’s cursed status. The false star reappears just as an escaping Bortus and Kelly are captured and about to be executed; the appearance of the star changes their fortunes, and the fortunes of all the Giliac prisoners. Back on the ship, a returned Bortus and Kelly share a joint, month-late birthday celebration. Kelly is reunited with her current beau, ship’s teacher Cassius (Chris Johnson) and Bortus is reunited with his mate Klyden (Chad Coleman) and their son. Kelly also informs Ed that the incarceration of the Giliac has been fully discontinued everywhere on Regor 2, and that Ukania has been reunited with her daughter. The crew speculates on the future of the Regorians; did giving them a false star in their Giliac constellation just reinforce their belief in astrology? Kelly reasons that by the time the Regorians travel into space and discover the fraud, they will most likely abandon such beliefs…hopefully. Like “Mad Idolatry” (which took on religious iconography) and “Majority Rule” (which took on social media), “All the World…” takes on another ritualized practice of our Earth; in this case, the continued, persistent belief in the long-ago disproven pseudoscience that is astrology. This is one I’ve been waiting a long time for (shame on you, Star Trek, for not doing this one first). Astrology is a concept that I have a hard time believing people still take seriously. It’s a multi-million dollar industry, conning untold millions of people worldwide into believing that the sun and planets’ positions at the time of their birth preordains their personalities for life; never taking into account that the constellations of the zodiacal belt appear in their current configurations only relative to our planet, and they are not fixed. Constellations in our galaxy change over thousands of years into different patterns. Scorpius will no longer resemble a Scorpion thousands of years hence, and the archer of Sagittarius might resemble a pelican at that same time. The night sky over the capitol of Regor 2; a culture living in mortal fear of superstition…sound familiar? My late mother was a big believer in astrology, and even I got caught up in it as a kid, but then a funny thing happened…I grew up, and realized that astrology was complete bulls#!t. I remember at my old retail management job, many years ago, a coworker of mine (a very sweet lady from Thailand) was a fervent believer in Chinese astrology, which assigns personality traits from the year of one’s birth (corresponding to the Chinese lunar cycle, of course). She innocently asked me what year I was born. I told her I was born in the year of the Horse (the fact that I knew that about myself was admittedly pathetic). She recoiled with a look of near-horror. It was as if I admitted I had chained children living in my apartment as slave laborers. She told me the Horse (the fire horse, specifically) is a ‘bad sign…a very bad year.’ Upon researching that fun little factoid, I discovered that many abortions performed in Asia (particularly in Japan) were performed during the Year of the Horse, which like The Orville’s Giliac, is believed to be a cursed sign. The stars, planets and universe are wondrous things, and we are connected to them in a very real and primal way (we are literally the condensed, cooled-down living matter from our own solar system’s birth). But the stars and planets do not exist solely for our interpretations of them. They move on their own courses throughout the galaxy, and will gradually fade, go nova, die, renew, etc. ad infinitum till the end of our universe. All of the matter of our own planet (that which isn’t flung out into deep space) will eventually be enveloped by our dying sun a few billion years from now. When our sun dies, it’s mass will add to the mass of a new nebula, which will eventually birth new stars. None of the constellations we see today will exist in their current configurations by then. There won’t be Aries, Taurus, Gemini, Cancer or any other familiar signs of the zodiacal belt. Not to mention the largely ignored thirteenth constellation of the zodiacal belt (Ophiuchus, which the sun was in at the time of my own birth…). Seth MacFarlane and Dr. Ann Druyan at Planetfest 2012. I was lucky to attend this event. Given MacFarlane’s own admiration of the late pseudoscience debunker and astronomer Dr. Carl Sagan, it’s not surprising that he’s chosen to take on Sagan’s work of educating the masses through pop entertainment. This was part of the reason MacFarlane executive produced the 2014 continuation of Sagan’s 1980 COSMOS TV series (based on his 1980 book). 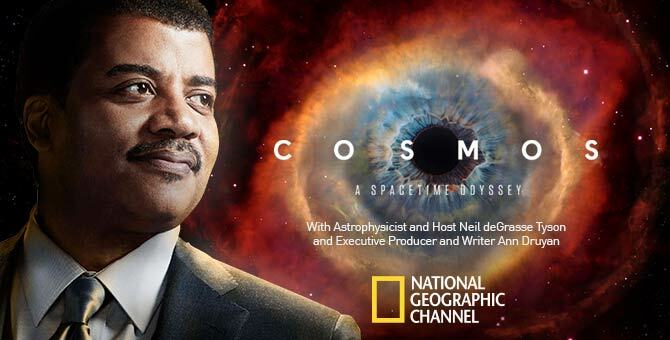 Dr. Neil deGrasse Tyson hosts Seth MacFarlane’s continuation of the late Carl Sagan’s COSMOS. In fact, I was in attendance during a Planetary Society event celebrating the 2012 landing of the Curiosity rover on Mars, when unexpected guest Seth MacFarlance (a fellow Planetary Society member) came onstage and, with Dr. Ann Druyan (the late Sagan’s widow), announced his intention to produce the continuation of the COSMOS series. That announcement brought the house down. I’ve also heard MacFarlane give many interviews on late-night talk shows where he’s expressed a passion for debunking myths. While Sagan chose to do so in a more literal (but no less entertaining) way, MacFarlane is doing so through his trademark irreverence and humor. Both approaches work, as one can learn and be entertained at the same time…and maybe even get a laugh or two in there, as well. In this age where disinformation seems to be running unchecked (“Truth isn’t truth!” “Alternative facts,” etc. ), and homeopathic ‘remedies’ flood pharmacy shelves (homeopathic ‘medicine’ is nothing of the sort), maybe it’s time we try to counter that tendency wherever we can, even in our pop entertainment. Science isn’t a belief system; it is demonstrable, and it is repeatable. Unlike the offerings of pseudoscience or psychics, science offers firm results that you can use over and over again. While the outmoded practice of astrology is still observed by many (some of whom might be offended by both the episode and by this article, perhaps), I can only offer my apologies… perhaps I should be taken off to a Fire Horse labor camp? Reblogged this on Trumble Times. Another strong outing from The Orville. This show just keeps getting better and better.